Vector network analyzer provides not only magnitude and phase information, but also offers up to 110 dB dynamic range, makes group delay and time domain measurements, and utilizes vector accuracy enhancement to minimize measurement uncertainty. 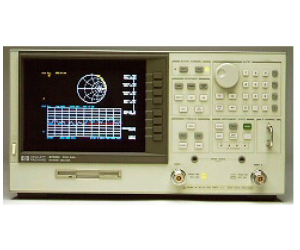 BRL Test - we are Agilent 8753D experts for sales and repairs. Frequency range from 30 kHz to 3 GHz, or optionally 6 GHz. Your 8753D is calibrated, certified and guaranteed to work accurately right out of the box - no problems. Enjoy the added reassurance of a full warranty backed by BRL Test's world class lab. Option 002 Harmonic Measurement Capability .For measuring swept second and third harmonicresponses. Option 006 extends harmonic measurement capability to 6 GHz. Option 006 6 GHz Frequency Extension. Provides source and receiver operation to 6 GHz. Do not order Option 006 with Option 075. Option 010 Time Domain Capability. For viewing reflection and transmission responses in time or distance domain. Option 011 Delete Built-in Test Set. Removes test set components and allows direct access to the R, A, and B receiver inputs. Source start frequency limited to 300 kHz. Do not order Option 011 with Option 075. Option 075 75 Ohm Impedance. Replaces the standard 50 ohm test set with a 75 ohm test set. Test ports are 75 ohm type-N connectors. Do not order Option 075 with Option 006 or Option 011. Option 1D5 High Stability Frequency ReferenceProvides improved frequency accuracy over timeand with temperature variation.